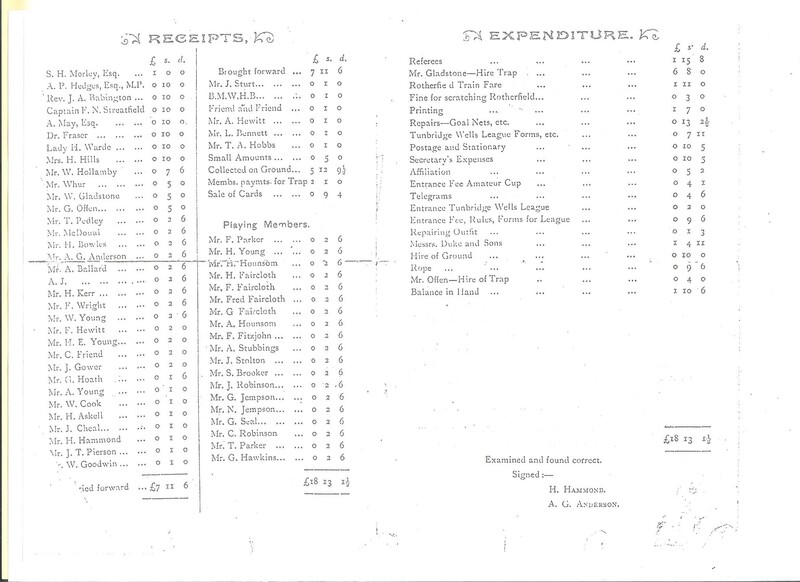 The history of the Fitzjohn family and attachments given in this document have been passed to the Society by Margaret Pyle (née Denney), granddaughter of Fred Fitzjohn. 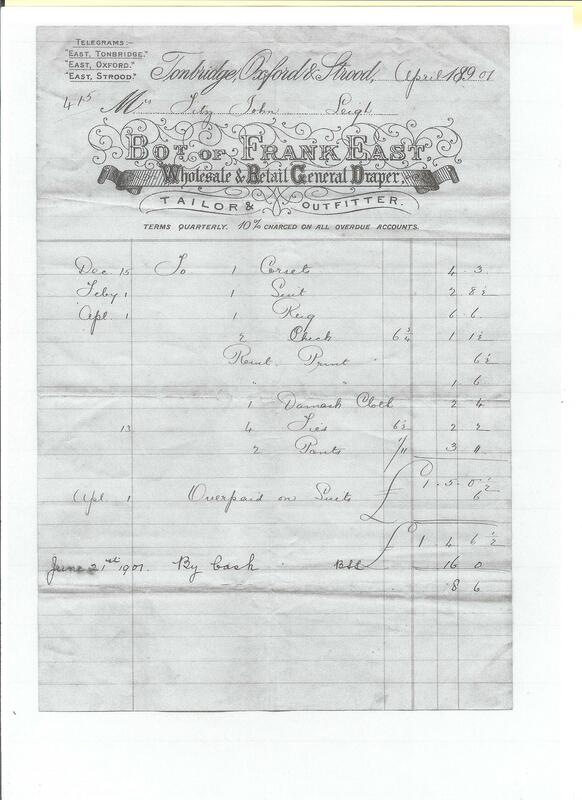 At the end of this document is an outline family tree of the Fitzjohns. 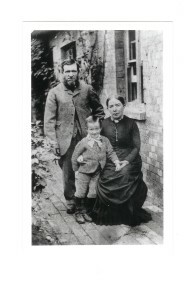 An account of the lives of James and Susan Fitzjohn, from being born in rural farming communities of North Hertfordshire, moving to work in the Stamford Hill area of London in the 1860s and then on to rural Kent – the village of LEIGH c1870. 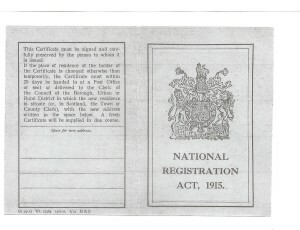 James Fitzjohn was born in January 1839 in the village of Westmill in North Hertfordshire. 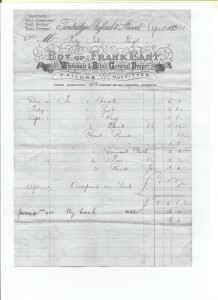 His wife, Susan (née Blake) was born in 1838 in the adjoining village of Aspenden. 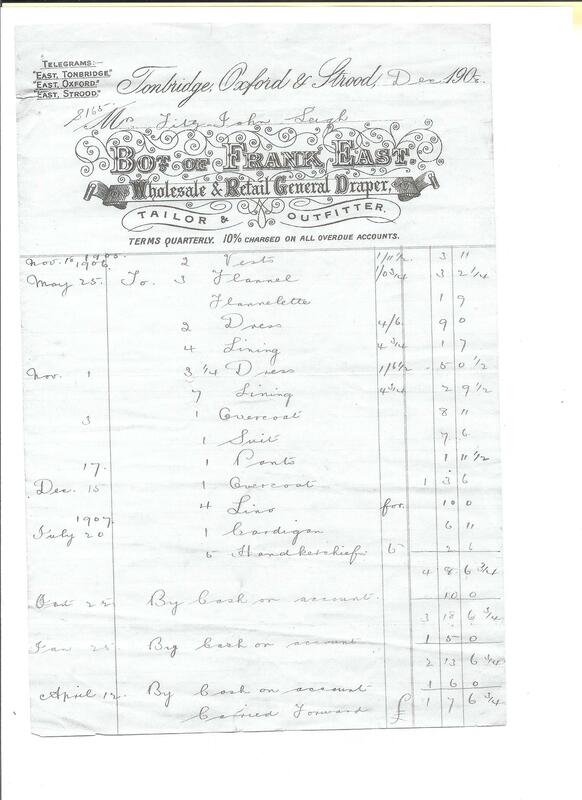 In the 1861 census(1), James, aged 22, was still living in Westmill with his mother Mary who had remarried after James’s father, Thomas, had died in 1847. 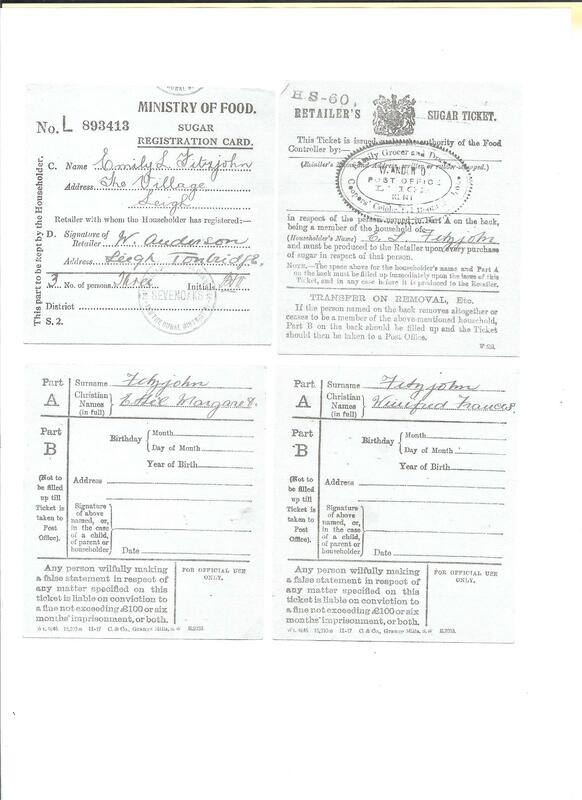 Susan had moved to London and is listed as a housemaid living in the home of a linen draper, William Dawn and his family at 185 City Road, Shoreditch(2). James was obviously keeping in touch with Susan and on 4 June 1864(3) they were married in the Parish Church of West Hackney, London. 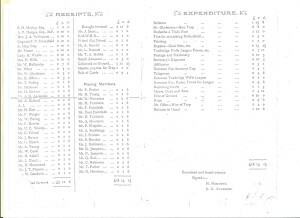 James and Susan’s first child, Charles, was born in March 1865 and their second child, Ellen, born in October 1867, both in Stamford Hill, London(4) – both addresses shown on their birth certificates reveal that they are in close proximity to Craven Lodge, Stamford Hill – the home of Mr Samuel Morley(5) at that time. 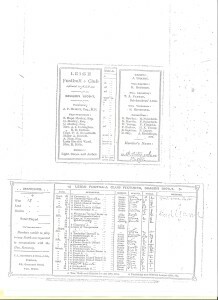 By the time of the 1871 census(6), James and Susan and their two children, Charles and Ellen were living in Leigh, Kent at the Penshurst Road Lodge so must have moved to Leigh c1870, and presumably James in the employment of Mr Samuel Morley who had purchased Hall Place in 1870(7). At a date not known, the Fitzjohn family moved further down the High Street to 1 Park Cottages (the one of 3 cottages – now two residences, The Stone House and Park Cottage). 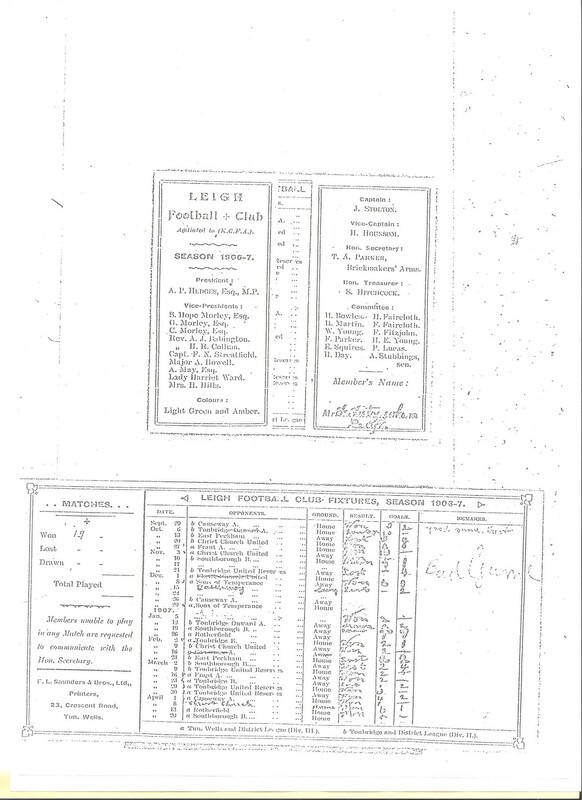 Their three other children were born at this address – Robert James in June 1871 (he died in 1895 and is buried in Leigh Free church burial ground), Ada Jane in June 1873 and Frederick Walter (my grandfather) in June 1883. 1 Park Cottage, High Street, Leigh. 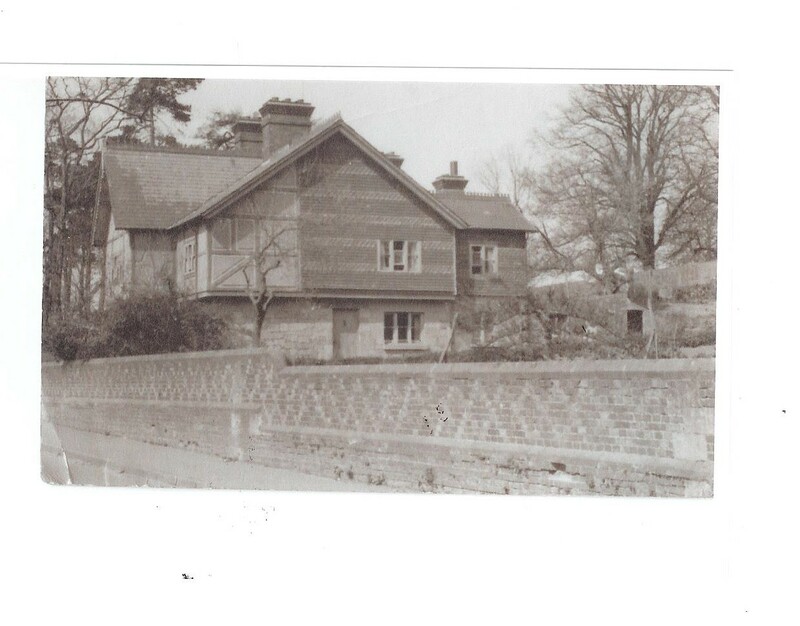 Taken ca 1950s before the bungalows were built. Home of James and Susan Fitzjohn until 1910. Tenancy continued with their son, Fred and his wife, Emily and family until Emily died in Jan 1968. Fred had died in 1948. Leigh ca. 1890: James and Susan Fitzjohn with son Frederick born June 1883: taken at 1 Park Cottages, Leigh. 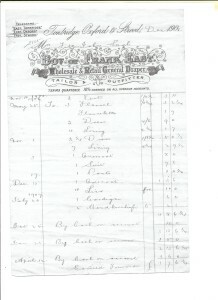 Receipt of Frank East of Tonbridge for Susan Fitzjohn 1908. On 14 February 1910(8) Susan, aged 71, died in Tunbridge Wells Hospital and was buried in Leigh Free Church burial ground on 18 February 1910*. During that evening James, aged 71, was taken ill and died at home on 20 February (8). 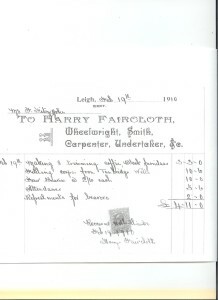 He was buried in Leigh Free church burial ground alongside his wife on 22 February 1910*. 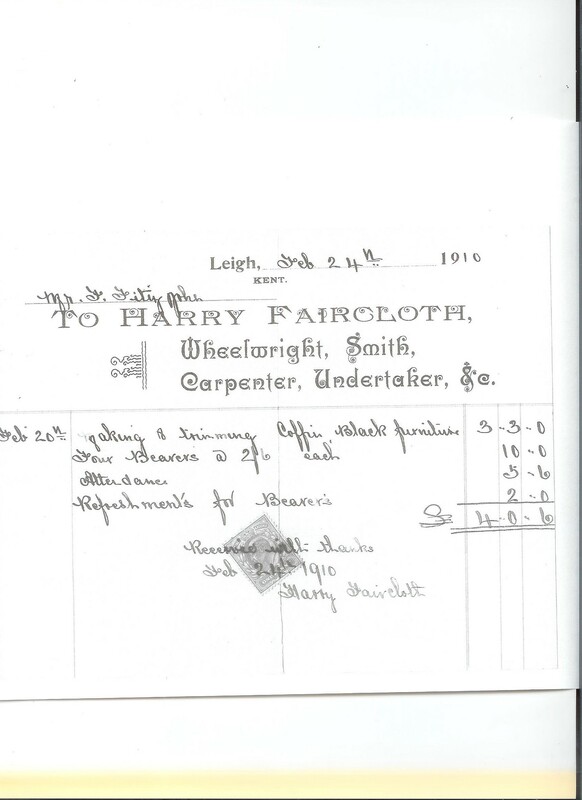 There are 2 invoices from Harry Faircloth, the village “Wheelwright, Smith, Carpenter and Undertaker &C”, giving the cost of their funerals: for Susan £4.11s.0d and for James £4.0s.6d. 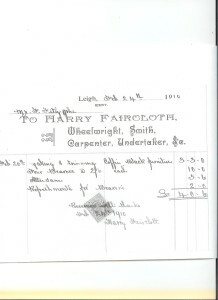 Harry Faircloth’s Receipt for Burial of Susan Fitzjohn 1910. 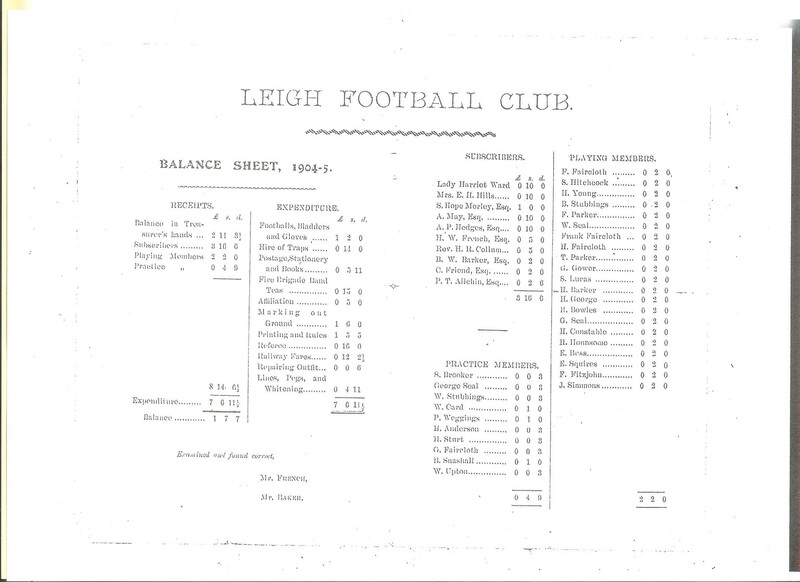 In an obituary printed in the Kent and Sussex Courier(9) on 25 February 1920 it reveals that James had been in the employ of Mr Hope Morley and his father, the late Mr Samuel, for 47½ years (from c1862/63) and first came to Leigh about 40 years ago (c1870) when the late Mr Samuel Morley bought Hall Place Estate. 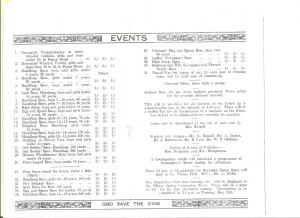 This last piece of important information obtained recently from the obituary has confirmed the link with James Fitzjohn working for the Morley family at the Craven Lodge estate in Stamford Hill in London and his subsequent move to Leigh. 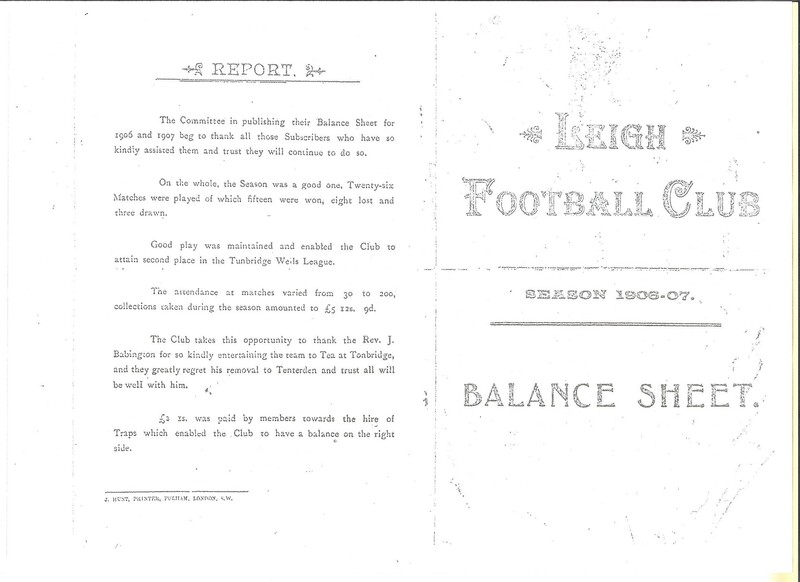 Fred was the youngest son of James and Susan Fitzjohn who lived all his life in Leigh. 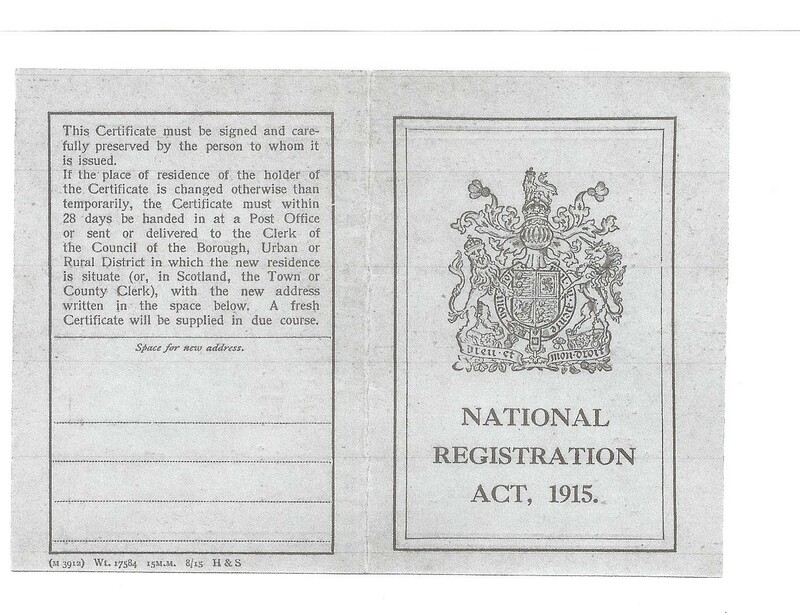 He was born in June 1883 at 1 Park Cottages in the High Street. 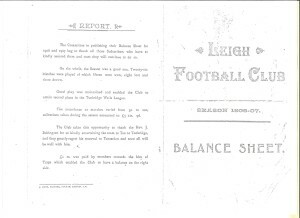 As a young man he was a keen sportsman, playing for the village football team as a goalkeeper and for the cricket team. 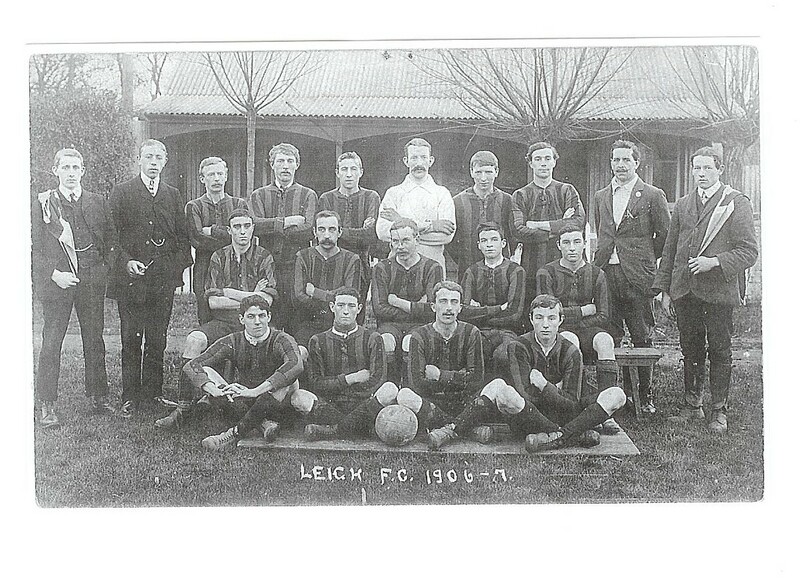 Fred was also a member of the Leigh Fire Service. 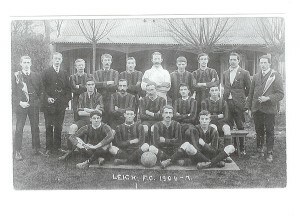 In the picture below, Fred Fitzjohn – as goalkeeper – is clearly seen in white in the back row. 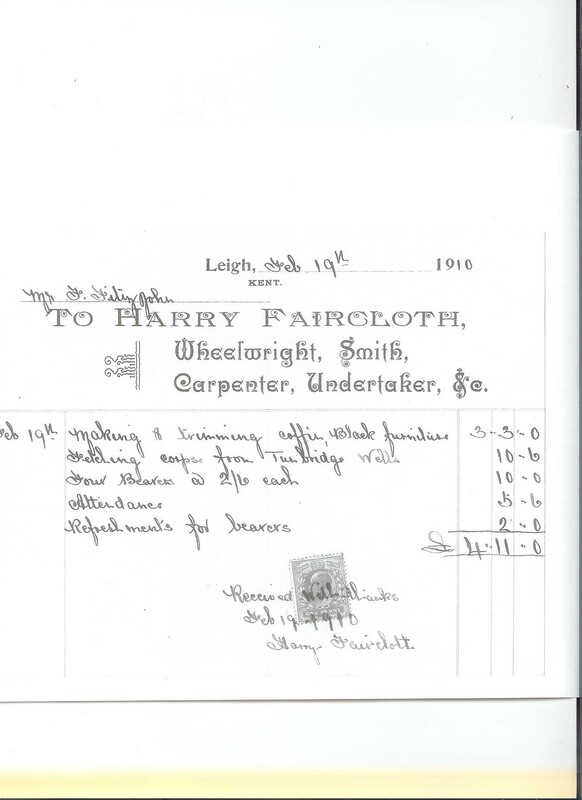 In the 1901 census(1) aged 17 years he was working at the Powder Mills and apart from army service in WW1 continued in employment there until the 1930s. After the loss of both his parents within one week in February 1910, Fred married Emily Wilkins on 10 April 1910 at Cowden parish church (father was William Wilkins, see picture below). 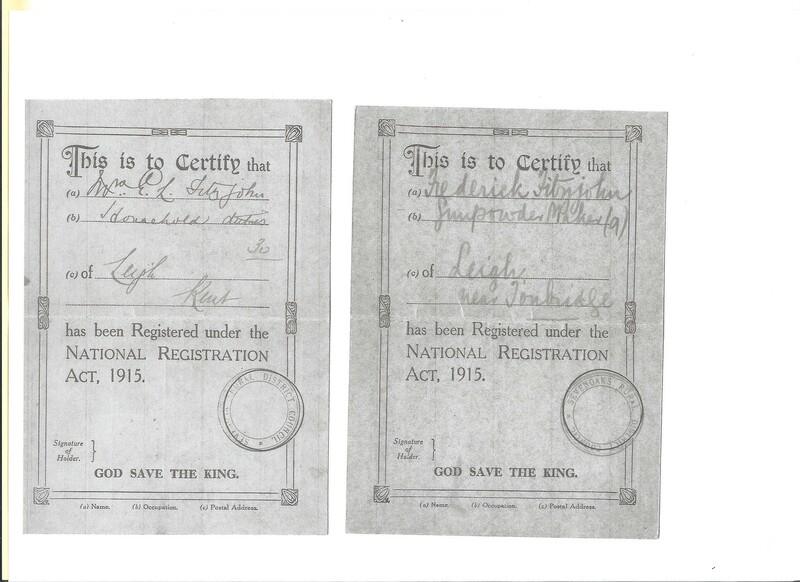 Emily was born on 10 December 1885 in Penshurst. 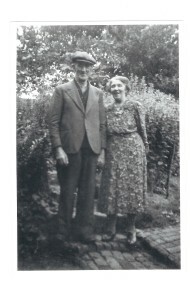 Fred, with his new wife, continued to live at 1 Park Cottages where their three children were born – Winifred, known as Peggy (my mother) in November 1911, Ethel in September 1916 and James (Jim) in June 1920. All three children attended the Village School and took employment in the local area. 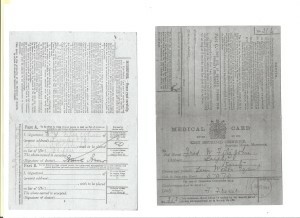 Frederick Fitzjohn Medical Card, signed by F Fraser. 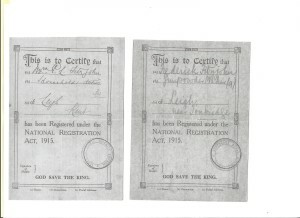 1915 National Registration Act card: for Emily and Frederick Fitzjohn. 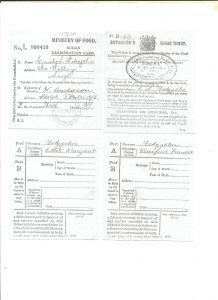 WW1 Ministry of Food Card, showing W Anderson’s signature as shopkeeper, plus Emily and daughters, Ethel and Winifred. In 1916 Fred was called up for WW1 service, serving in the Royal Garrison Artillery and saw service in France. 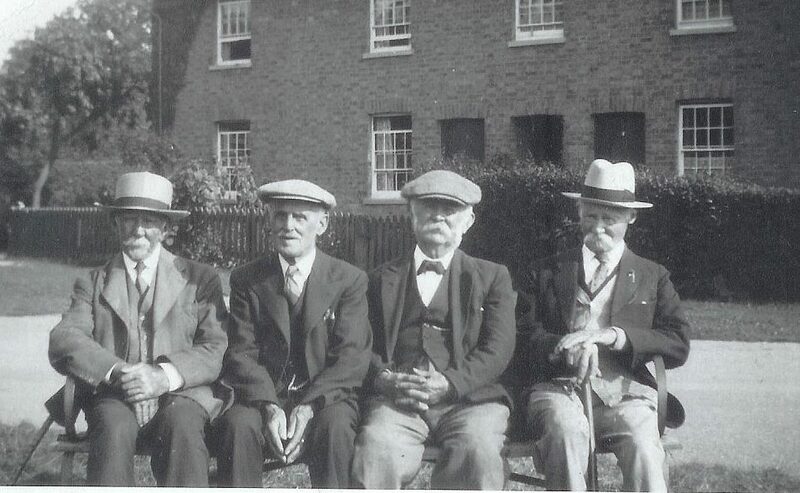 Thankfully he returned to village life without injury to continue his employment at the Powder Mills, where in June 1928 he was awarded a silver watch and silver medal for 27 years’ service by Curtis and Harvey(2). He continued in their employment until the Powder Mills moved to Scotland. In WW2 he was an ARP Warden for the Village. 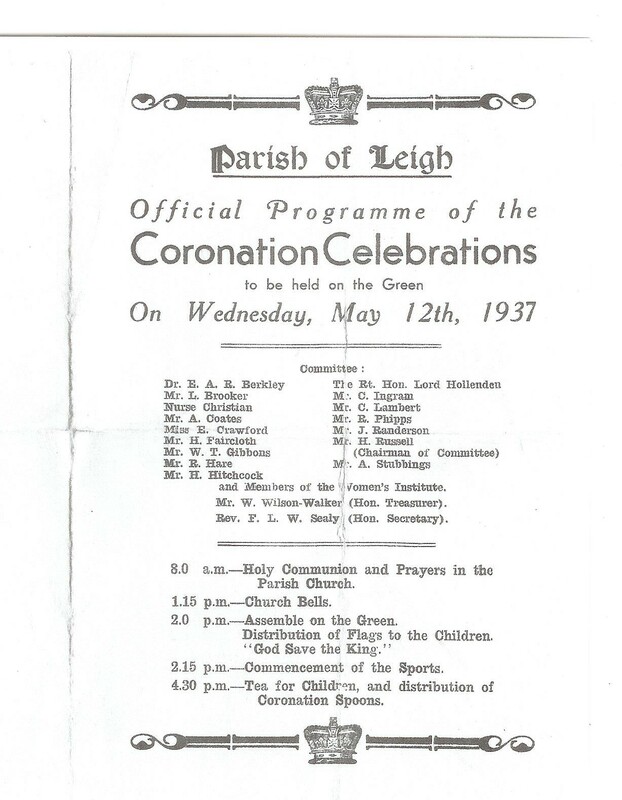 Throughout her time of living in Leigh, my grandmother, Emily, entered into village life, joining various clubs and societies. 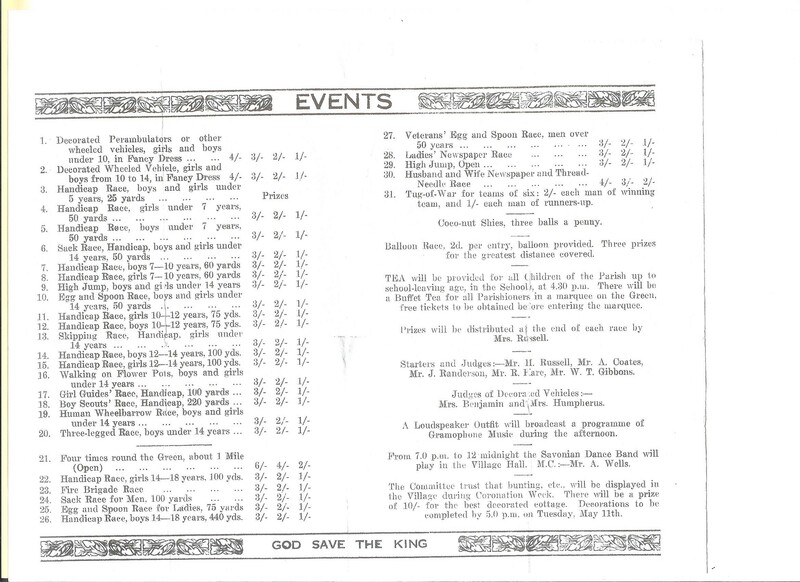 For many years she was a member of the Leigh Women Unionists, delivering the monthly magazine “Home and Empire” until her retirement from the committee in 1939(3). Also she was a member of the Women’s Institute, helped to organize fund raising events such as village dances, whist drives, the local Hospital fund and other WW2 fund raising events. For many years she went hop picking at Pauls Farm to earn extra cash for the household budget. 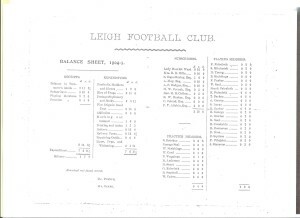 Then there were the teas for Leigh cricket team home matches which she did for 33 year until her retirement in 1958, when she was presented with an 8-day clock by the Club for her contribution (4). Fred died in January 1948 leaving Emily a widow for 20 years but she did not let the grass grow under her feet and continued to take an active part in village life. Also she enjoyed travelling to visit various members of her family as well as having visitors to her home. 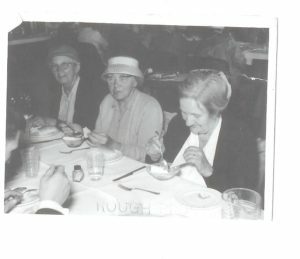 Go to GOLDEN YEARS CLUB which has the names of a few people in the picture as well a further pictures of Emily Fitzjohn. BUT IF ANYONE RECOGNIZES ANYBODY IN THIS PICTURE PLEASE LET US KNOW. Contact us. 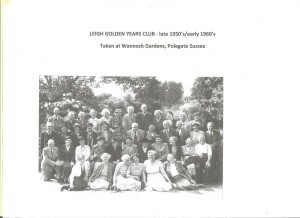 Photograph taken on a Golden Years Club outing in the early 1960s. Emily Fitzjohn is on the right, next to her is Mrs Phoebe Card (nee Wilkins), her sister, who was the wife of Will Card (bellringer at Leigh) who lived at 7 Garden Cottages. Another Golden Years Club outing – late 1950s/early 1960s. 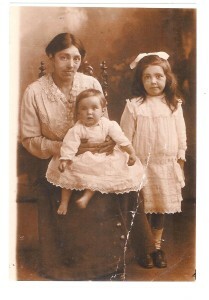 On the left is Miss Minnie Brooker, in the middle Emily Fitzjohn and on the right if Mrs Penny Brooker. For more information on the Brooker family press the link. 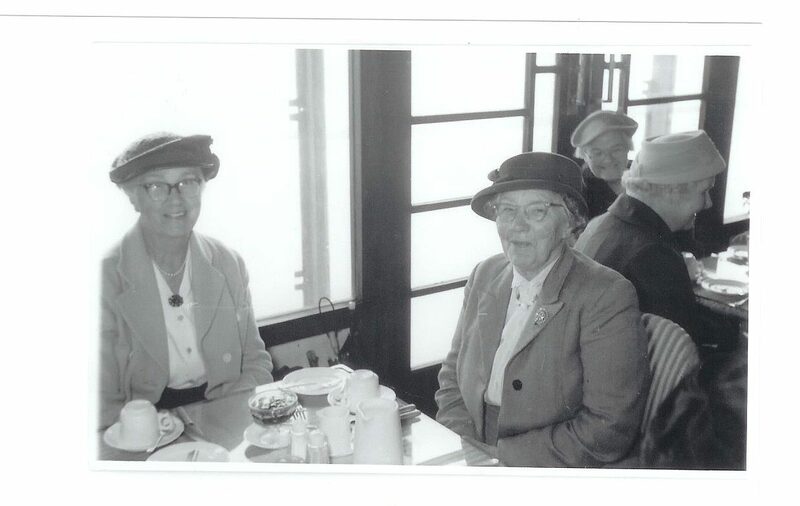 Sadly Emily died in January 1968, aged 82 years and was buried in St Mary’s churchyard with her husband, Fred. This was the end of an era for the Fitzjohns living at 1 Park Cottages in the High Street. 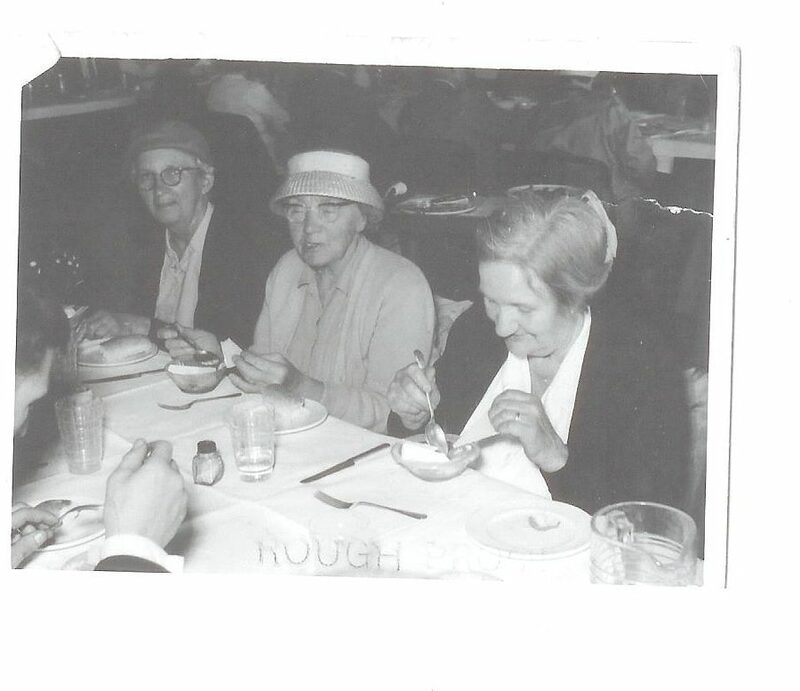 So what of Fred and Emily’s three children: after WW2, Ethel (Mrs Desautels) continued to live in the village until she died in November 1999. 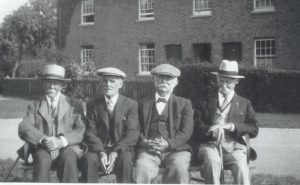 Jim returned to live in the village in the 1950s before moving to the Hildenborough area. 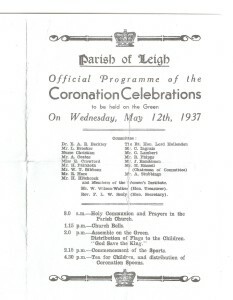 My mother, Peggy, married William Denney at St Mary’s Church, Leigh on 10 December 1938 and moved to live in Reading, Berkshire. 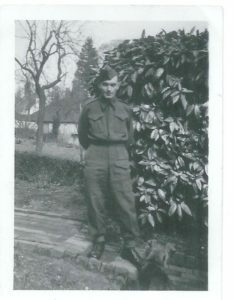 William Denny, father of Margaret Pyle – whose mother was Peggy Fitzjohn – taken near front gate of Park Cottage – Rose Cottage is in the background. 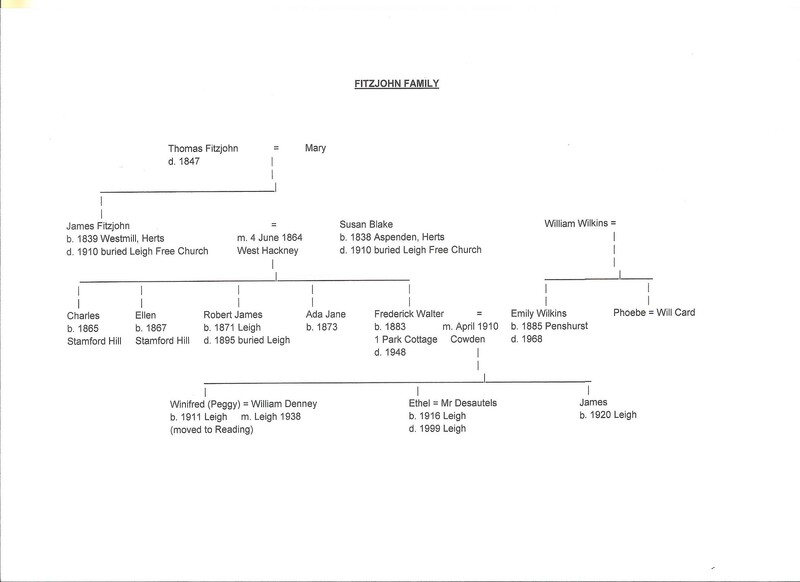 Being the eldest child of Peggy and Bill, I have many happy memories of visiting my Leigh grandparents from the 1940s until 1968 and then continuing to visit an aunt and cousins. Leigh Village will always hold a special place in my heart.